We are delighted to announce Pulse College as Educational Partner for this years inaugural Kingdom Con! Ireland’s newest comic con event, created by our friends at Dublin Comic Con who run Ireland’s largest Comic Con, takes place 1st and 2nd of April at the INEC in Killarney. 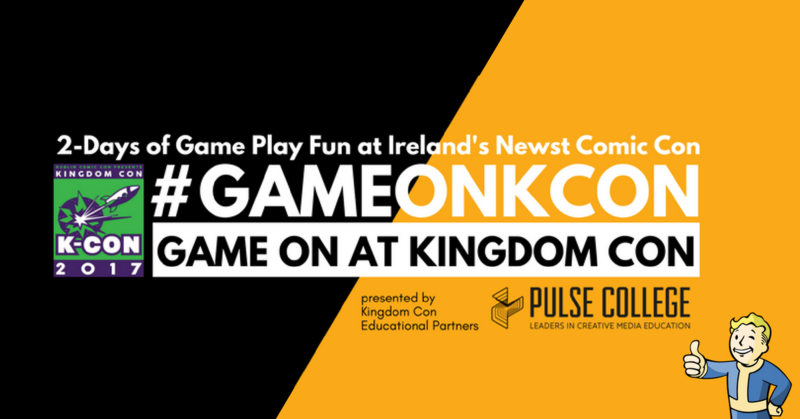 As part of #GameOnKCon, Pulse College will be running game design workshops, VR & GameDev experience’s, and first play’s of new Irish games being launched later this year! *entries available on the day, simply pop over to the Pulse College Welcome Booth on the First Floor. Follow us now on social media links below to keep up to date in the run up to the event and don’t forget to use the Pulse College and Kingdom Con hashtag #GameOnKCon to chat to us. To purchase tickets for the Kingdom Con, click here. Follow Kingdom Con on Facebook and tick ‘going’ on the facebook event page to let us know you’ll be there! This entry was posted in blog, Games Development. Bookmark the permalink.